As we get ready for out trip, it is my intention to use up what’s in our cupboards and fridge. There by saving money and using stuff up before it goes bad. Saving money means more money towards spending on our trip. My last two weeks have been living pretty frugal. And I am okay with that. This week’s meal planning, I thought it would be frugal to combine a few items from the grocery store to go with the food already in the cupboard. Let’s see how this goes (pen and paper on the kitchen table. Let’s see what I can scribble down). Tuesday: Vegetable Paella (S)and a mixed greens salad(F). Not bad. With more practice I will get better. As you can see, most of what I need to shop for is produce. With that, I will only buy what is needed. And most of what already have stocked is produce that needs to be used up before it goes bad. I know this is a financial blog and I am rambling raw-vegan. But I am stoked! It’s been great! I have been listening to my body and what it desires to eat. I have been whipping up smoothies and eating salads like crazy! Those salads… I have been craving. Weird! But totally delish! And my body has been quenching up the thirst with water or tea. Last night I was offered a beer and I turned it down. Like my body doesn’t even desire or want it. Tried a soda the other day and it was the sweetest un-tastiest thing I’ve had. Out to dinner and it was a baked potato and salad for me. Or I’ve had soup and salad for lunch during work. Snacks: I mix my own trail mix with cranberries, nuts, and pretzels or eat an apple. I crave yummy goodness now. I love it! I’ve also been listening to my body when it tells me its full. And my portions are rather small now. But I also eat 6 mini meals/snacks throughout the day to keep me nourished. I haven’t lost anymore weight, but I have maintained it well. I feel great. 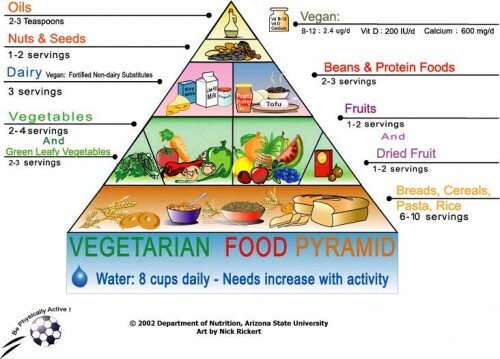 Financially with a Vegan diet: it is not expensive for me. I am still trying to figure out why people think it is expensive to eat healthy. I think it might be that people are not aware of how to substitute products when cooking. There are always frugal alternatives to expensive ingredients when called for in a recipe. A block of tofu is $1.30 – $2.00. Can of beans is $0.89 – $2.00 (usually get 2 servings, at least). or buy a bag of beans to cook and freeze in individual servings. Then you’ll get a lot for your money! My salad bags are $2.00 and feed for a week. Soup – buy what is on sale or even better make you own! When produce is near its end and needs to be used, I whip up soups for lunch. And all those meals will make great lunch leftovers (save more $$ :)) and the extra fruit will be used up in my morning smoothies. Loving it! This entry was posted in Family & Relationships and tagged menu, Menu Plan on 2010-03-21 by Christine. Don’t get me wrong. I’ve been on automatic pilot, at work, with putting milk in my oatmeal and then saying, “Doh!” But, I am not going to beat myself up over it. Eating Vegan is change that takes time. However, I have replaced the milk at home with Almond Milk and the family loves it! Works great in all my cooking, too. Small changes to make a healthy difference. Want to know what else? Well, if you don’t I am going to tell you anyways. I’ve lost 4.5 pounds this week! And yes, my meals filled me, I didn’t go hungry, and I feel great! So, I am not giving up this Vegan Kickstart anytime soon. Financially, my vegan meals don’t costs us anymore than normal. I buy more produce and canned beans. Doesn’t cost me so much, so far. I know many of the recipes call for eggs, cheese or milk. But I use Earth balance for butter, omit the eggs (with no problems), use Almond Milk… there are ways around it. This entry was posted in Family & Relationships and tagged menu, Menu Plan on 2010-03-07 by Christine. Why is it men don’t eat for a day they lose 5 pounds? Women don’t eat for a week and only lose 1 pound. LOL. Yup, that is my first week total. This week: Now that my husband has been working overtime and I get home late, it has proved extra hard to get a homecooked dinner on the table (want to eat at 7-8pm?). 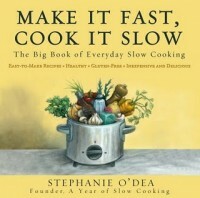 I have decided to implement a week of slowcooking. 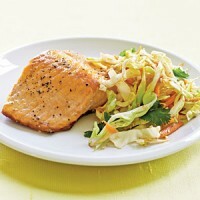 Put the ingredients in the crockpot during morning and wha la!, a delicious dinner at night. Friday: Can’t pass this one up. Looks so tasty! Baked Sinach and Cheese Noodles with a mixed greens salad. Not diet food, peeps! But that is where portion control comes in. Saturday: I have some salmon to use up. Along with the remaining spinach. So, I will be making the Lemon and Dill Salmon with Spinach. Can’t decide on a side. Hmmm…. Need to give it some thought. 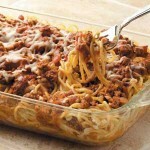 This entry was posted in Family & Relationships and tagged menu, Menu Plan on 2010-02-22 by Christine. Menu Plan Monday – I am going on a diet! Much like holding one’s self accountable for the budget, the weight also follows the same. Since October, status quo in my life has slowly been changing. Mixed with the holidays… well, I compensated it all with eating. The problem is (and I don’t know if all women have this), I surpassed or hold borderline to the weight I told myself would never happen. Normally, I can fall back into routine and go back to the intended weight. Not this time and I am having difficulties getting myself to return. So, I feel it was time to share this information with you. Because I need to start holding myself accountable for my weight in order to lose it and maintain. I need to feel healthy again for me, my family, my husband, and my health. I need to lose approximately 13 pounds. My plans are put myself on a 1200-1400 caloric diet (This number was figured using Lean Cuisine’s Keeping on Track Tools). The calories are not as low as you think, because I seldom have time for exercise. Eat 3 meals and 2 snacks per day – I enjoy eating small portions throughout the day as it aids in digestion better. 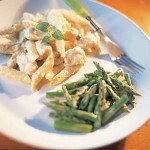 Limit carbs – watch the bread and pasta intake. Break up calories per meal – I can have approximately 300-350 calories for breakfast, lunch, and dinner mixed with 100 – 125 calorie snacks. Or if I eat a bigger lunch meal then dinner will be lower. Use common sense – If your options are a crossaint or a bowl of granola with milk – its easy to figure out the granola is better for me. At the start, I like to write down what I have eaten through the day. Then as time moves on with a routine of sorts, I can safely eat with confidence. Breakfast(s): Oatmeal, piece of wheat toast, and a banana; Meusli with almond milk (lots of good stuff in this! ); fresh fruit, yogurt, and a piece of wheat toast; green smoothie. Lunches: I bought Lean Cuisine 300-350 lunch meals. They were on sale for $1.99 + a free coupon for a 6 pack of Skinny Cow Ice cream sandwiches. 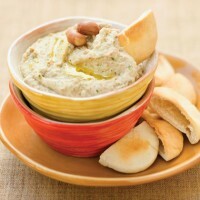 Snacks: Hummus and veggies, trail mix, fruit and crackers. Sunday: Happy Valentine’s Day! Diet starting tomorrow. We are heading to Bucca di Beppos and off to see Valentine’s Day at the movie theater. Monday: Tuna salad with mixed greens and a bowl of tomato soup with sourdough croutons. Tuesday: Small portion of Mac and Cheese with (you guessed it) a mixed greens salad. Wednesday: 3 bean vegetarian chili, cornbread, and mixed greens salad. Thursday: Salmon, brown rice, and steamed broccoli. 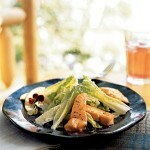 This entry was posted in Family & Relationships and tagged diet menu plan, menu, Menu Plan on 2010-02-14 by Christine. Health and Fitness are on the tops of people’s minds at the start of the New year. With that is opting to start a Vegetarian Lifestyle – as it is known to lower cholesterol, lower high blood pressure, lower triglycerides, lower our cancer risk, etc… [read 57 more reasons here]. All that equates to feeling great! –Grow an herb garden – learning to cook with herbs is a great way to enhance flavors! Oregano, basil, cilantro, rosemary are a few of my favorite herbs. I like to dry and chop them to refill my spice jars. – Substitute a menu’s item for what you have on hand. If a recipe calls for tofu in the stir fry, but have a zucchini that needs to be used up – then go for it! Cubed zucchini works great for dishes requesting marinaded tofu. These are only a few ways to living a vegetarian lifestyle on a frugal budget. Do you have a great tip to add to this list? Friday: Veggie Pizza (ordered) with tomatoes, garlic, onion, and black olives. Saturday: Baked potato topped with chili & sourcream, sliced tomatoes with olive oil and cracked black pepper, and mixed greens salad. Made myself hungry with this post. Remember, even if a vegetarian meal calls for expensive ingredients there is always a frugal alternative. Have fun when making your meals. Be sure your plate has lots of colors (green spinach, red bell pepper, purple eggplant) and you’ll be sure that you are getting your much needed nutrients. To help you create your vegetarian meal plans, check out the International Vegetarian Union for many great recipes! This entry was posted in Family & Relationships and tagged menu, Menu Plan, vegetarian meal plans on 2010-02-08 by Christine. The good thing, the living room looks great with the minor redo. And I cleaned out a bunch of drawers and magazines. Feeling lighter with out the extra weight of stuff. We are going out to eat – Our house is getting ready for a Super Bowl party. We’re gonna be tuckered out getting our house ready for a soiree of friends. So, this Friday night we are hitting the city for a bite to eat! Fend for Yourself Saturday – leftovers, fix your own, lazy day Saturday… the kids love it because they can fix usually whatever their stomachs desire. Super Bowl Nacho Bar – warm up the queso in the crockpot, put the beer on ice, gather good friends and watch a great game! This entry was posted in Family & Relationships and tagged menu, Menu Plan on 2010-01-31 by Christine. Did you know there are over 600 varieties of heirloom tomatoes? Geesh. Two years ago, I took a trip to San Diego for work (happy to oblige on company’s expense). During the last evening of my trip, I took a trip with a group of coworkers to a restaurant whose name escapes me. But what I do remember is the vegetarian pasta dish I ordered adorned with yellow pear tomatoes. Let me tell you, they were delicious! Slightly softened from cooking but burst with flavor in your mouth. 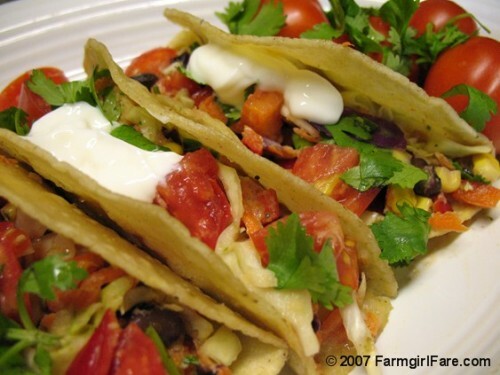 Mexican Tacos – No recipe here. Simmer a can of black beans in taco seasoning. Prepared fried taco shells in oil. Fill with black beans, tomatoes, cilantro, onions, cheese, and a dollup of sour cream. Soups & Sandwiches – Would of made soup but didn’t have the time. Couldn’t decide the kind so I bought Tomato & Basil and Split Pea. Will be accompanied by Sourdough Sandwiches filled with sprouts, tomatoes, cheese, and meat. Chili Cheese Dogs, Spiral Mac & Cheese, and Fries – Its a kid’s night. All prepackaged (and yes, totally unhealthy). There some great stuff on this week’s menu! 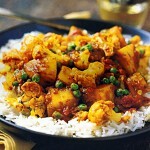 Now I am off to make a batch of curry for this week’s lunches. 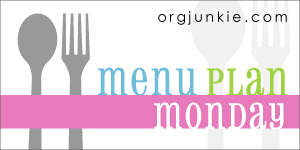 Menu plan Monday is hosted by Orgjunkie.com. Head on over there to find more great recipes! This entry was posted in Family & Relationships and tagged menu, Menu Plan on 2010-01-24 by Christine. Southern California is going to get 8 inches of rain! To this gal who has been experiencing high 70’s sunshine weather this is a lot of water to be dumped in one week.To offset being drowned this week, I am planning on cooking up some comfort food (hopefully the comfort won’t be put on the hips – lol). You know, the thought of rain makes me want to bake. Maybe I will whip up some Zucchini-Pineapple Muffins (store nicely in the freezer). They will go great with my morning coffee. Well, enjoy this week’s Menu Plan Monday. BTW, MPM is hosted by I’m an Organizing Junkie. Head on over there to find many other blogger’s MPMs. This entry was posted in Family & Relationships and tagged menu, Menu Plan on 2010-01-17 by Christine.